"Description of the Chicago District"
Click on the pictures of the maps to go to larger images. Click on the left map to see Chicago townships. Click on the right map for latitude/longitude and modern topographical boundaries. Both maps from Bretz, 1940. 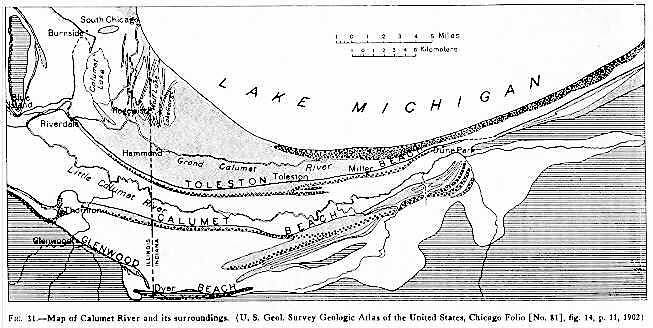 Perhaps the points of most special geologic interest in the district lie in the beaches and other deposits of the ancestral Lake Michigan and in the contribution to the history of the Great Lakes furnished by their study. To an interested observer the topography is at once significant. The city of Chicago is situate on a low, strikingly flat, crescent-shaped plain bordering the head of Lake Michigan. At the north end of this crescent is Winnetka, on the lake shore, about 8 miles north of Chicago. From here the plain broadens southward, attaining a width of 12 to 15 miles in a southwesterly direction from the city, whence it again narrows as it passes eastward about the head of the lake (fig. 1). From the shores of Lake Michigan, the surface of which is about 581 above mean tide level, this plain rises gradually to a nearly uniform height at its inner margin, about 640 feet above tide, or about 60 feet above Lake Michigan. West and south of this plain bordering Lake Michigan is an elevated belt of more or less strongly undulating topography. In some parts there is an immediate rise from the plain to a moderately rolling surface, while in western Cook County and eastern Dupage County the surface passes almost imperceptibly from flat to gently undulating. In either case the surface rises until a maximum altitude of about 200 feet above Lake Michigan is reached, whence it declines to the west and southwest. More extended observation shows that this ridge-like belt comes from the north and swings about the head of the lake basin. It is in reality a glacial moraine (fig. 1) and has been called the Valparaiso moraine, from the town of Valparaiso, Ind., which is situated upon it. Where crossed by the Wabash Railroad between Palos and New Lenox, situated respectively on its inner and outer margins, it has a width of 15 miles. Gaps in morainal ridge - Desplaines valley and the "Sag"
Cut directly through this low, broad ridge in a southwesterly direction from Summit to Lemont is the valley now traversed by the Desplaines River, the Illinois-Michigan Canal, and the Sanitary and Ship Canal of Chicago. About 2 miles below Lemont this valley bends southward and reaches the outer margin of the moraine near Joliet. The valley has abrupt slopes, varies in width from one-half mile to 1.25 miles, and is 30 to 150 feet deep. The floor of the valley is nearly flat from side to side. At its lakeward end the bottom is continuous with the Chicago Plain and is less that 15 feet above the level of Lake Michigan. From Summit to Lemont the fall is so slight as to be spoken of as "the 12-mile level." Tributary to this valley at Sag Bridge station about 3.5 miles above Lemont, is a second valley of like dimensions, known as the "Sag." This runs nearly due west from the village of Worth, on the Wabash Railroad, to Sag Bridge station on the Chicago and Alton Railway. It is traversed by a small marshy creek known as the Calumet Feeder. These converging valleys cut off a triangular undulating tract having a length east and west of 6 miles and a width north and south at its lakeward end of 4 miles. This tract is known as Mount Forest. The floor of the Sag, as well as that of Desplaines Valley, is continuous with the Chicago Plain. The two valleys thus give ample outlet from the plain southwestward across the morainal belt and thence by way of Illinois River to the Mississippi and the Gulf of Mexico, with a rise of less than 15 feet above the present level of Lake Michigan. The most prominent topographic feature of the plain is Blue Island Ridge, 7 miles west of the lake at South Chicago. This ridge extends due north and south, having a length of 6 miles, a width of about 1 mile, and an elevation of 25 to 50 feet above the surrounding flat. Just west of South Chicago, between Blue Island Ridge and the lake, is an elevation of rock known as Stony Island. Its longer axis has an east-west direction. The length of the "island" is 1.25 miles, it width one-half a mile, and its height about 20 feet above the surrounding marshy area. The north side of Chicago, between North Branch of the Chicago River and Lake Michigan, is also occupied by two broad elevations rising 30 to 40 feet above the lake. Traversing this plain and converging toward the southwestern outlets there is a series of low ridges of sand and gravel as related to the lake, to the outlets, and to one another as to be very significant of the history of the district. These are the shore lines of an ancient lake, the predecessor of Lake Michigan. The drainage of the district belongs to two great systems, the St. Lawrence system on the east and the Mississippi system on the west. Hence the area is traversed by the continental divide. So insignificant is this watershed near Summit, near Chicago Ridge, and east of Palos that at these places it can scarcely be seen at what point the waters separate. They are continuous, and at a given point sometimes flow eastward to the lake and sometimes westward to Desplaines River. the completion of the Chicago drainage canal has really obliterated the divide at Summit, as a part of the waters of the lake itself now flow through this artificial channel to the Mississippi. This is an artificial reestablishment of what was once a natural discharge of the lake waters through the Chicago outlet to the Mississippi system, and is fully discussed under the heading "Lake Chicago." The natural drainage of the plain in and about the city of Chicago is very poor, owing to the flatness of the surface and the consequent low gradient of the streams. This has made the sewage problem on of the most difficult with which the city has had to deal. Considerable areas within the city limits would be utterly uninhabitable but for artificial drainage systems. That part of Cook County east of Desplaines River and north of Stony Island has, as its only natural drainage lines, the sluggish North and South branches of Chicago River. [The] North Branch has its origin about 4 miles west of Highland Park, Illinois and flows 27 miles in a southeasterly direction. [The] South Branch has its origin northeast of Summit, not far from Desplaines River, and flows northeastward through the city to unite with North Branch within a mile of the lake. The confluence of the two forms Chicago River, which flows eastward into the lake through the heart of the city. This is a statement of the natural drainage by this stream. These natural conditions have, however, been greatly modified by the opening of the Sanitary and Ship Canal, which took place in January, 1900. 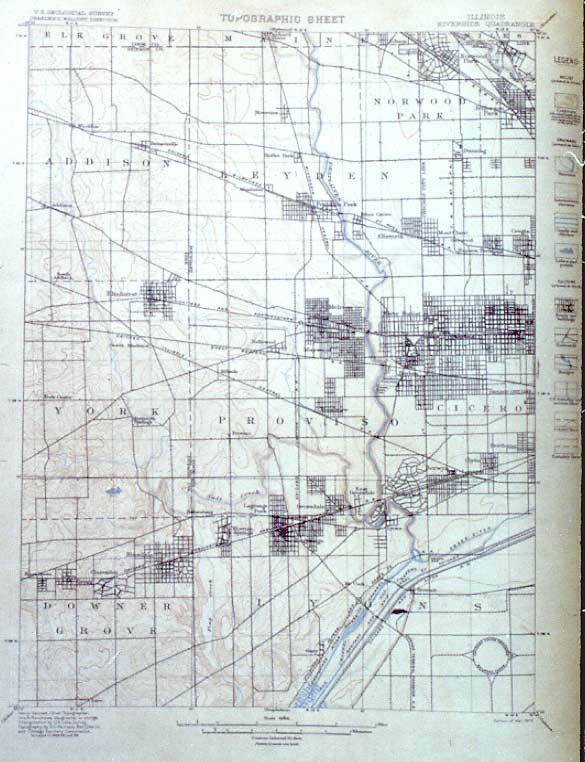 This canal, while planned with a view to furnishing a deep waterway from Lake Michigan to Illinois River, was constructed primarily as a drainage canal to improve the sanitary conditions of the city. By a reversal of the flow in South Branch and the main trunk of Chicago River, the whole stream and a large amount of water drawn directly from Lake Michigan became tributary to the Illinois and Mississippi river systems. By repeated dredgings Chicago River and its branches have been enlarged to form a river harbor for the immense shipping of the most important port of the upper Great Lakes. [The] South Branch has been made navigable for lake boats a distance of 6 miles through the city, and North Branch for a less distance. [The] North Branch has for some time been flushed by water drawn from the lake through the Fullerton avenue conduit. The Illinois and Michigan Canal has furnished a navigable channel from South Branch of Chicago River through Desplaines Valley to Illinois River. Through the aid of the pumping works at Bridgeport this canal has been made to take part in the drainage of the area by carrying the water to the southwest. 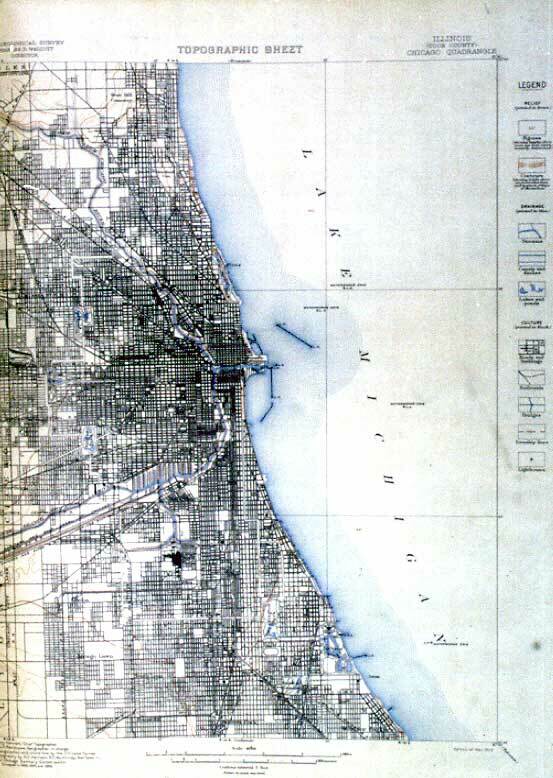 The drainage of the southern part of the Chicago Plain, together with the lakeward slopes of the bordering moraine belt, is accomplished by Calumet River and its tributaries. This stream follows a very anomalous course (fig. 14). It has an interesting history, which is discussed under the heading "Recent changes." It rises in the western part of Laporte County, Ind., and flows in a westerly direction, nearly parallel with the lake shore, a distance of 45 miles, to the village of Blue Island. here it turns abruptly and takes an easterly direction nearly parallel to its previous course and but 2 to 3 miles distant. It finally reaches the lake after doubling upon itself nearly 22 miles. 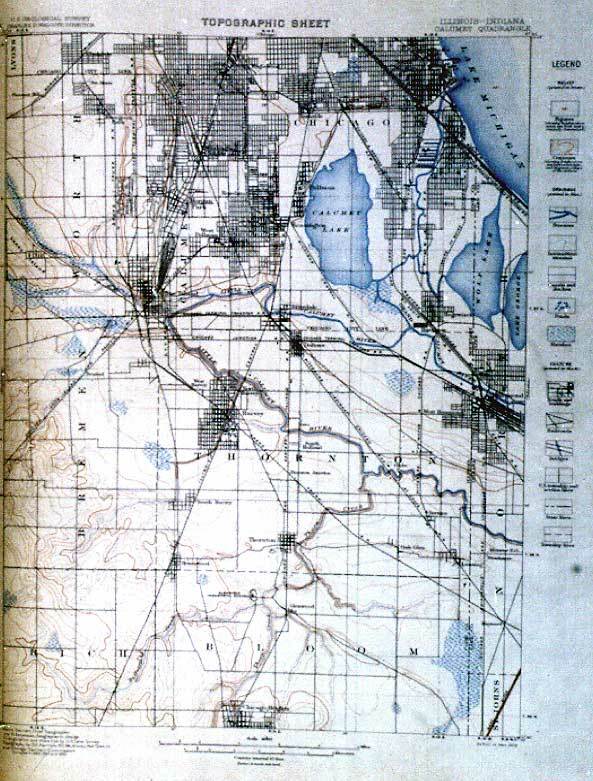 To distinguish the two parallel portions crossing Lake County, Ind., the southern portion has received the name Little Calumet, and the northern the name Grand Calumet. One peculiarity of Calumet River is its apparent possession of two outlets. The Indiana debouchure, just mentioned, is the original one, the other is at South Chicago. A channel from that point passes between Calumet Lake and Wolf Lake and connects with the river proper near Hegewisch. This channel, which is said to be artificial, as well as the main stream between the confluence and Hammond, Ind., has been dredged within recent years and small steamers now ply daily between Chicago and Hammond. The Indiana debouchure is very largely closed by shore drift, wind-blown sand and aquatic vegetation so that there is but little current in the Grand Calumet River. 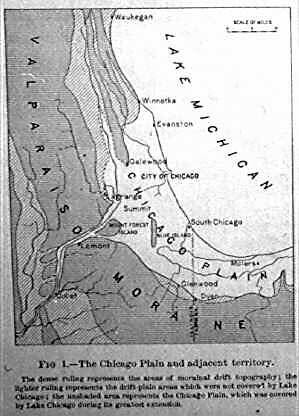 The opening of the channel to South Chicago has drawn the flow largely in that direction, and the Grand Calumet may be said to be reversed. During the spring and fall flood seasons the stream fills its low banks and overflows considerable areas, so that early geographers were wont to say: "The country around the extreme south bay of Lake Michigan has the appearance of the sea marshes of Louisiana." Tributary to Calumet River at a point about 2.5 miles northeast of Thornton is Thorn Creek, which, with its tributaries, Butterfield Creek and Deer Creek, drains the lakeward side of the moraine in this vicinity. This is an active line of drainage with a considerable gradient and has cut a sharp-channel 20 to 25 feet in depth. Near Glenwood and at Thornton the erosion has reached the limestone below the bowlder clay. The Desplaines has been found to have at Riverside an extreme flood stage of about 10,000 cubic feet per second, with an occasional higher volume, as in April 1881 when it reached 13,560 cubic feet. It has been estimated by Professor Cooley that on an average of once in five or six years during the past fifty years, the flood has exceeded 10,000 cubic feet, while the ordinary yearly flood, as shown by the marks on the dam at Lyons, just below Riverside is 6000 to 7000 cubic feet per second. In these extreme floods nearly half the water has been wont to discharge into Lake Michigan, and in ordinary floods a small discharge has usually occurred. The drainage area above Riverside is scarcely 1900 square miles. This gives, at the maximum extreme flood of April 1881, a flow of fully 12.5 feet per second per square mile of area. The low water volume is exceedingly small. Professor Cooley reports that at Riverside in 1887, it reached a minimum of 4.27 feet per second and for five months did not exceed 16 (an illegible fraction) cubic feet per second. He estimates that for nearly every year the extreme low water at Riverside and Joliet reaches above 5 cubic feet per second. The fall in the flood plain of the Desplaines is 90 feet in 60 miles, or at the rate of 1.5 feet per mile above the Lyons dam. At Riverside a rock barrier is crossed with a descent of about 14 feet in 3 miles. Here the stream makes a sharp turn, doubling back upon itself to the northeast three fourths of a mile and again turning southeast and south. From Summit to Lemont there is practically no grade. The floor of the valley from Summit to Sag Bridge station is of bowlder clay, and from Sag Bridge station to Lemont is of limestone, bare, or but thinly covered. In this nearly level floor the stream has cut a very shallow bed. At present the river, in a large part of its course from Summit to Lemont, occupies an artificial channel, having been shifted toward the north side of the valley to make room for the new drainage canal. The principal tributary of Desplaines River in this region is Salt Creek. This flow in a direction slightly east of south, in a depression in the morainal belt. Its course is apparently consequent upon the topography as far as Fullersburg. 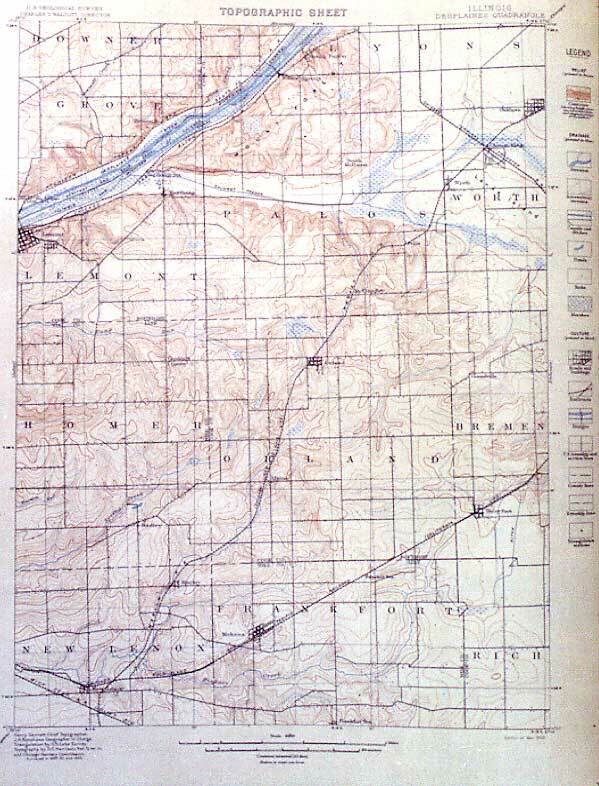 From this point, while the depression continues southward as the valley of Flag Creek, Salt Creek has abandoned what appears to be its natural course and turns eastward, passing out upon the plain and uniting with the Desplaines at the sharp bend at Lyons. The rate of fall in Salt Creek is 3 feet per mile for 18 miles above the Fullersburg dam. From this point to Lyons, a distance of 8 miles by the course of the stream, the fall is 41.3 feet. The outer slope of the morainic belt south of the Desplaines Valley is drained westward and southwestward by numerous creeks, of which the largest is Hickory Creek in Will County. This unites with [the]Desplaines River about 1 mile south of Joliet. Most of these streams drain marshes in the morainic belt. Between South Chicago and Hammond, Ind., is a group of shallow, marshy lakes or ponds. These are Calumet Lake, Wolf Lake, and George Lake. The largest, Calumet Lake, covers about 3 square miles. Hyde Lake has been entirely drained. Considerable marsh areas surround these lakes. Extensive marshes also occur east of Auburn Park, north of Stony Island, south of Maynard, Ind., and all through the lake border region of Lake and Porter counties, Ind. Large parts of these marshes have been artificially drained. This ends part 1 of The Chicago Folio by William Alden, 1902. (1) Topography: The plain and rivers . (2) Chicago Geology: Paleozoic . (3) Pleistocene .